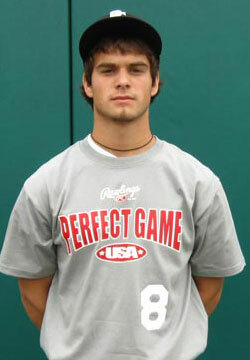 Nicholas Santalucia is a 2010 LHP/OF with a 5'10'', 170 lb. frame from Chesterfield, VA who attends Clover Hill Math/Science Center. Athletic build, short compact arm action on the mound, quick arm, simple and easy delivery, 3/4 arm slot, good armside run on fastball, feel for 1 to 7 curveball, shows good pitchability, can drive the ball to all fields, extension in swing, stays on the ball, good instincts on the bases, strong student.